There are set fees for a 20 ‘unit ( $383.81 ), 40 ‘( $767.62 ), 45 ‘( $863.57 ) consigned to one consignee. There are no Trucking charges. All refrigerated containers are plugged in to preserve the cargo. There is a plug use fee of $50.00 per unit per day. Boat Licensing Fees charges go according to categories on the Boat Licensing form. Cargo Dues only by short ton only. 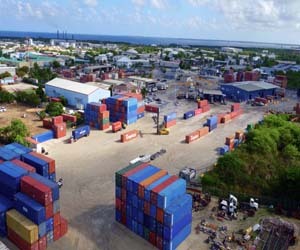 If a container consigned to one consignee is asked to be stripped, then there is a Stripping charge of $10.00 per ton. Any cargo may be left in storage for 5 working days free of storage charges . After the 5 working days, there is a Storage charge of $2.10 X the short or cubic ton X the days for the first 30 days. After 30 days, the charge is $5.25 X the short or cubic ton X the remaining days. For vehicles or any kind of mobile equipment, the charges are based on the short ton only. Storage charges include Holidays, Saturdays and Sundays. Berthing Fees are determined by (the gross weight) X (the rate or by the length in feet) X (the rate), whichever is the greater. There are no Trucking charges on Owner/Agent billing. There are no charges on recyclables such as empty crates, empty pallets, etc . 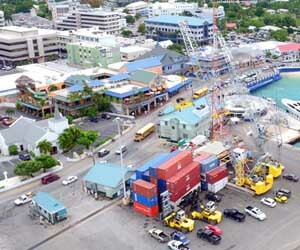 There are no charges on any goods leaving Cayman Brac or Little Cayman. Boats are billed the same as consignee billing. Empty containers, flatracks or trailers may be left at the Cargo Distribution Center for 1 working day not including Holidays, Saturdays and Sundays. After the 1 st working day, there is a Empty Storage Container charge of $4.00 X the days X the number of 20′ containers and $7.00 X the days X the number of 40′ containers.